MEDIA ADVISORY, July 17 /Christian Newswire/ -- Its revelatory and shocking insights make this only-one-of-its-kind book the single-most critical forewarning of what this generation must shortly yield to globally. No reader is left unstirred. Today's guessing-game of the world's future ends here. 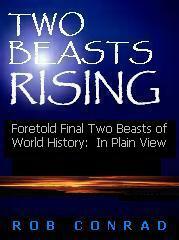 Released on JULY 7, 2008 at Amazon's Ebook sites where it is being sold/distributed. It can be read at NO CHARGE/LIMITED TIME at our site: www.Heisnear.com.